Many newbie gardeners or even the occasional master gardener fined it a bit of a challenge, to grow a particular flowering or, new vegetable plant successfully. Either in their backyard garden, containers full of what they believe to be good topsoil, or raised beds have issues. No amount of watering, fertilizing and pest control seems to make their plans flourish. The very thing that escapes them or maybe it is just the last thing they ever think really makes a difference. Of course, what they are missing for whatever reason is checking the PH levels in the garden is the most important step to growing healthy plants in any garden. What soil PH levels really tell us is what the acidity or alkaline levels are in our garden topsoil. Ranging between the highly acidic PH levels that start at zero to the highly alkaline of fourteen. Subsequently, a soil with a PH level of 7.0 is neutral, neither acidic nor alkaline. Take for instance; sweet water has a PH level of 7.0 or neutral. 1. Most fruit plants grow best in garden soil in the six points zero and six point five range. 2. Leafy vegetables grow best in garden soils with a PH level between, six point five and seven point zero. 3. When the PH is not at the proper level for a particular vegetable plant, no amount of water, fertilizer or sunshine will make the vegetable plant grow well. 1. When the Ph. of your garden soil is too acidic, below six point zero. Add pelletized lime, or a good organic option we can use is using wood ashes from the fireplace, to help increase your garden soil alkalinity. 2. When your garden soil is a bit too alkaline, 7.0 and above, adds sulfur. Using, pine needles, tree leaves and Pete moss will help to increase the soil acidity levels in the soil organically. 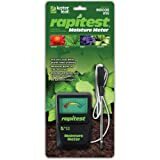 I believe we can all agree, discovering why learning to use a soil PH meter is necessary and easy, provides us with all the information we need to ensure our gardening success. 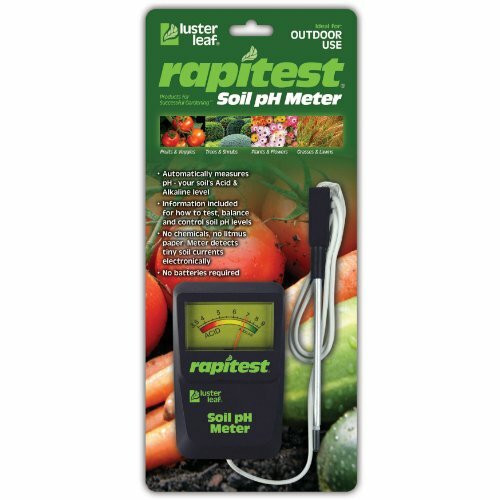 Now all we need do buy ourselves a good soil PH meter, use what we have learned to grow healthy garden plants. Remember, test the garden soil often, and in several spots around the garden, and take steps to adjust the PH when and where needed in your garden. On the other hand, for those of us that prefers to have someone else do the dirty work of determining the PH of their garden soil. You can always have it tested by your local county extension office for a small fee. Their phone numbers is in the blue edged pages of your local phone book, or simply Google your county extension office and give them a call. They will be happy to send your dirt off for testing. Just keep in mind, plan on the results getting back to you in a week or so. Personally, I rather not wait on some bureaucrat for the results of a test I can easily do myself. 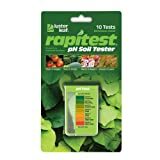 Using an inexpensive soil test kit, or for me the best option, a soil PH meter. That works well from 3 to 9 PH levels in minutes and ensure my garden success, how about you? Organic may be over hyped but organic food, organic gardening and organic compost is finding place in an ever growing statistics of our life and the organic world. Organic or Non-organic, which is the best garden and landscape Mulch? Imagine having the ability to step into a magical garden every single time you step out into your backyard. Which garden theme or style brings you peace, joy and pleasure? With winter looking as if it might finally be over and spring being here, now is the time to show your lawn some love! So time to think about Eco-friendly Lawn Care now! The best gas lawn mowers are the ones that take the effort out of lawn maintenance, and natural gas lawn mowers are the best option for yard care. Whether you're looking for a rotary lawn mower or a cordless model, the best lawn mowers are all available on Amazon - and all come with free shipping. How does compost effect this? Nice to meet you Sally, if you do not mind me asking, do you use a test meter, over the counter test kit and distilled water when testing your soil ph? I've been interested in soil chemistry for a while. I have to keep on top of cross contamination all the the time, to get good samples. Brenda, you go girl let me know how you like the potting bags, aka grow bags in your container garden. Grow a sack full of taters, a few tomatoes, bell peppers or what ever your heart desires. Thanks Mike. I'm going to send samples to the lab. I got paid today. I'm going to order some of those cloth containers to start my vegetable garden. Brenda Reeves, thanks for the question. The best way to determine the exact levels in your garden soil is to send samples out to a lab. You will find your county extension office is a great resource for this, and recommendations for amending your local soil types. The biggest problem many gardeners have using ph. meters, and over the counter soil test kits, eliminating cross contamination, water used in sampling, the containers soil is tested in containing contaminating residue etc. I'm in a Master Gardener program right now. 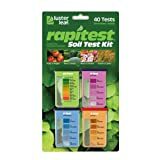 I was told that the over the counter soil testing kits aren't that accurate because they don't have a buffer. How accurate are the meters? 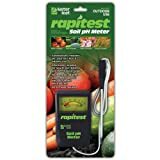 @LadyGuinevere digging that ole soil test meter out of the drawer and using it to test your gardens soil is a lot of fun. 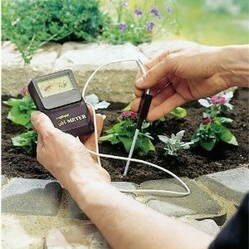 Testing the soil in your potted plants, containger garden and window boxes. Makes it less of a guessing game when it comes down to feeding and caring for all our plants. I have one of those but it's tucked away in a drawer somewhere. Now I know how o use it and what the best PH for various plants are. Thanks! @Pinkchic18 gardening is much more fun and rewarding when our plants are healthy and productive. Maintaining the proper soil PH is an important part of any successful organic flower and vegetable garden.